[170 Pages Report] The oil & gas application of thermoplastic pipes is estimated to grow due to an increasing demand for flexible pipes, umbilical and risers. The thermoplastic pipe market (value) is projected to grow at a CAGR of 6.2% from 2014 to 2019. The market is dominated by Asia-Pacific which accounted for a share of about 39.8% in 2013. It is estimated to be the fastest growing market at a CAGR of 7.5% from 2014 to 2019. Latin America is an emerging market, with the demand projected to grow at a rate of 4.9% during the forecast period. Increasing application of thermoplastics in the chemical and municipal sectors of developing countries in these regions is a prime growth factor. The market has been segmented on the basis of polymer type, application, and region in terms of value and volume. The market segments by polymer type include PE, PVDF, PVC, PA, PP, and others. The market segments for applications of thermoplastic pipe include oil & gas, municipal, mining & dredging, and chemical. The oil & gas and municipal applications have been further split into coiled tubing, flexible pipes and umbilical, water & wastewater applications respectively. The regional segmentation includes Asia-Pacific, North America, Europe, the Middle East & Africa, and Latin America. The thermoplastic pipe market was estimated to be 25,821.9 kiloton in 2014, and is projected to reach 33,742.3 kiloton by 2019, at a CAGR of 5.5% from 2014 to 2019. In terms of value, it is expected to grow from an estimated $55,430.2 Million in 2014 to $74,996.6 Million by 2019. Increasing usage of thermoplastics in the oil & gas industry, particularly in deepwater and ultra-deepwater applications, is one of the drivers of this market. Extensive use of polyethylene pipes for water and wastewater municipal applications are also contributing to the growth of this market. The report provides a full analysis of key companies and competitive analysis of developments recorded in the industry during the past four years. Market drivers, restraints, and opportunities of the market have been discussed in detail. The leading players such as Technip (U.S.), Advanced Drainage Systems Inc. (U.S.), Airborne Oil & Gas B.V. (The Netherlands), and Georg Fischer Piping Systems Ltd. (Switzerland) have been profiled in this report. In 2014, Asia-Pacific is expected to be the largest market for thermoplastic pipe, and it is estimated to grow at the highest CAGR during the forecast period. The key players prefer agreements, contracts, joint ventures, and partnership strategies to garner a larger share in the market and capture bigger customer base. The leading thermoplastic pipe manufacturers are focusing on emerging countries that are estimated to show potential demand for thermoplastic pipe in the near future. The market has been segmented on the basis of polymer type, application, and region. A thermoplastic material becomes soft when heated and hard when cooled. These are made of polymers linked by intermolecular interactions or van der Waals forces or the branched structures. Examples of the material are Poly Vinyl Chloride (PVC), Polypropylene (PP), Polyethylene (PE), Polyamide (PA), and others. Pipes manufactured using these types of materials make the categories of thermoplastic pipes. The usage of thermoplastic material to manufacture thermoplastic pipes has increased; the reasons for which can be attributed to the lightweight, corrosion resistance, low maintenance costs, and higher strength provided by the thermoplastic pipes. 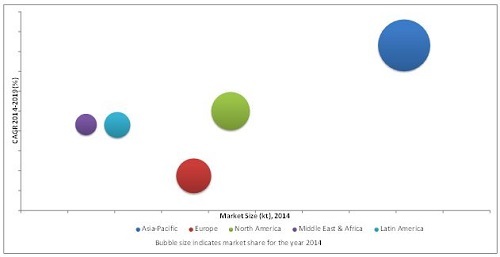 The market volume of thermoplastic pipe is projected to grow at a CAGR of 5.5% from 2014 to 2019. The oil & gas application is estimated to grow with increasing demand for flexible pipes, umbilical, and risers. The thermoplastic pipe market is estimated to grow with increasing deep, ultra-deepwater applications for oil & gas industry, as well as water and wastewater pipes for municipal application. Thermoplastic pipes are used in several industrial applications that include oil & gas, municipal, mining & dredging, and chemical sectors. 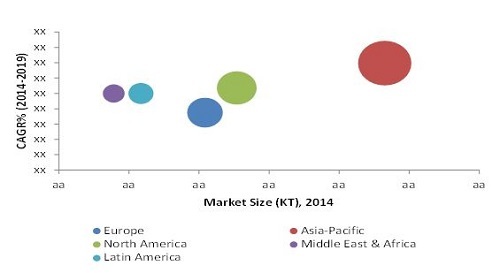 High demand for thermoplastic municipal pipes is driving the Asia-Pacific market. Latin America, and the Middle East & Africa are emerging markets with increasing application of thermoplastic pipes in the municipal and chemical industries. The region is expected to witness investment worth $770 Billion from 2011 to 2020 in the chemical industry of the region. Approximately 50% of this investment is expected to come from GCC member nations, with the rest shared by Iraq and Iran. The European market is the most mature, and is expected to register the slowest growth during the forecast period. In 2014, Asia-Pacific is expected to be the largest market for thermoplastic pipe and is estimated to grow at the highest CAGR. The key players of this market prefer agreements, contracts, joint ventures, and partnership strategies to garner a larger share in the market. The leading thermoplastic pipe manufacturers are focusing on emerging countries, which are estimated to show potential demand for thermoplastic pipes in the near future. 11.2 Advanced Drainage Systems Inc.
11.5 Airborne Oil & Gas B.V.
11.9 Georg Fischer Piping Systems Ltd. Figure 39 SWOT Analysis: Advanced Drainage Systems Inc.